Stitch bigger embroidery designs and enjoy less re-hooping with a large embroidery field—6 ¼" x 10 ¼". With 141 built-in embroidery designs, you’ll always find inspiration in the Aventura. Turn corners, follow curves and maneuver around appliqué shapes easily. 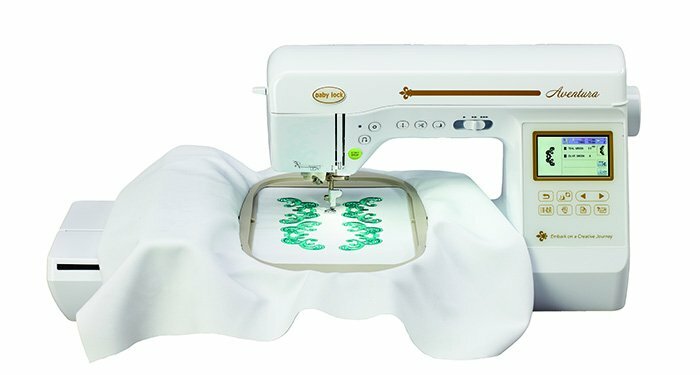 The Aventura delivers the right amount of pressure and thread tension when sewing or quilting on a variety of fabrics. Follow the path and press a lever. That’s all it takes to thread the Aventura. With 300 built-in stitches, you’ll have many creative options. From numerous utility stitches to decorative ones, you’ll find something for every project.